(Clockwise from above) The Stone Soup Collective founder Renee Orth at a Soup and Storytelling event; volunteer Dylan Duckworth serves residents of Ansonborough House; soups such as a vibrant vegetable medley are sold for $7 per 16-ounce jar. 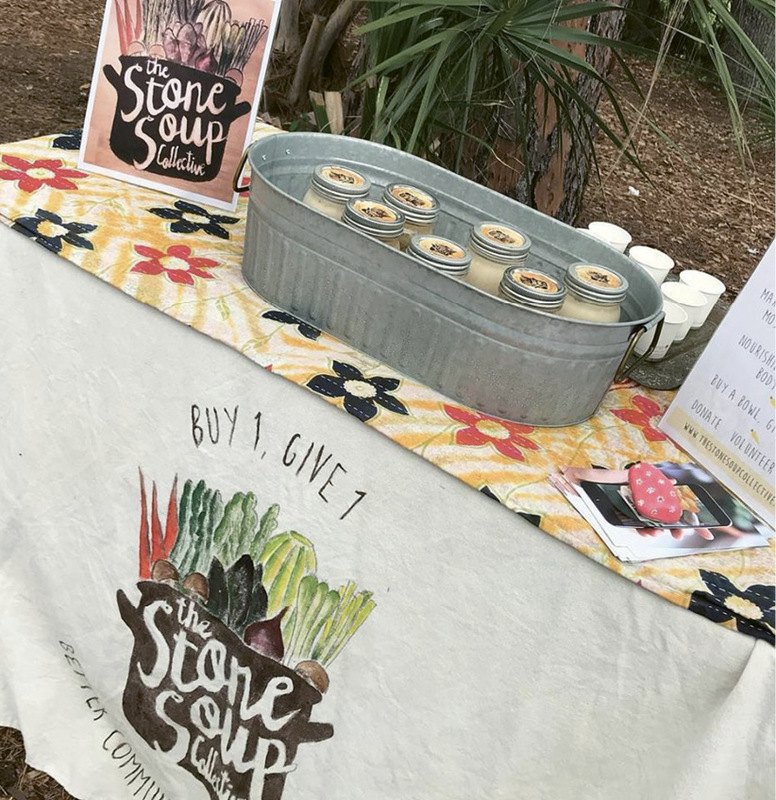 Everyone has something to bring to the table: That belief is the secret seasoning of The Stone Soup Collective, a nonprofit that creates, sells, and—most importantly—gives away healthy, plant-based soups throughout the Charleston area. “We get our name from an old folktale,” explains founder and executive director Renee Orth. The story goes that weary travelers stopped in a village only to find that none of its residents would give them any food. They asked for a pot and a rock and began to boil water for “stone soup.” Then the wise travelers mentioned that an onion would taste wonderful in their broth. A neighbor produced one. “Carrots would make it even better,” they remarked. And so it went until the pot was filled with a meal that the villagers enjoyed together. “Ultimately, they were all so much wealthier when they shared the little bits they had,” says Orth. She got the idea to bring together all of Charleston’s “little bits” after moving to town three years ago from her native Los Angeles. Having written a book called Conspiracy of Dreamers: Capitalism at the Service of Humanity, the practicing attorney had long been interested in social entrepreneurship. She decided soup would make the perfect foundation for a nonprofit that followed a “buy one, give one” model benefitting food-insecure senior citizens. After all, the warming dish serves as a healthy, easy-to-eat meal. It makes use of excess farm produce that would otherwise perish. And it creates the opportunity for a satisfying act of volunteerism, chock-full of tasks like chopping, slicing, and stirring that bring people together. The group will return to the Folly Beach Farmers Market this spring. “Today, we have a little soup-making family,” says Orth, who back-burnered her legal career to launch the Collective in April 2017. Here’s how it works: On Mondays, volunteers gather in the commercial kitchen at The Schoolhouse in West Ashley to make soups centered around produce donated by and purchased from businesses like Rosebank Farms and GrowFood Carolina. Advertising the day’s bounty—a miso tahini dish with local sweet potatoes, for example—via social media, they sell 16-ounce jars for $7 each from noon until 1 p.m.
On Fridays, volunteers again convene, this time in the kitchen of Charleston Area Senior Citizens (CASC). Preparing fresh pots full of soup, they serve the elderly residents of Ansonborough House next door, leaving plenty of fare behind for CASC to distribute through its Emergency Food Services, Charleston Food Pantry, and Meals on Wheels programs. Next up is the empowerment of independent groups to start their own Stone Soup chapters in the Lowcountry and around the US; the first is already active at the College of Charleston. The Collective has also partnered with Enough Pie for a Soup and Storytelling series at the Upper Peninsula’s Butterfly Book Nook. To find details on the December 4 event—plus more about this nourishing nonprofit—visit thestonesoupcollective.com.